For the second consecutive year and the third time in four years, Rustic was awarded the Best Youth Tour Operator during the annual Global Youth Travel Awards Friday in Edinburgh, Scotland. Rustic also won the award in 2017 and 2015, and was the runner-up in 2016. The awards are presented at the annual World Youth and Student Travel Conference by the World Youth Student and Educational (WYSE) Travel Confederation to recognize outstanding performers in the youth, student, and educational travel industry. 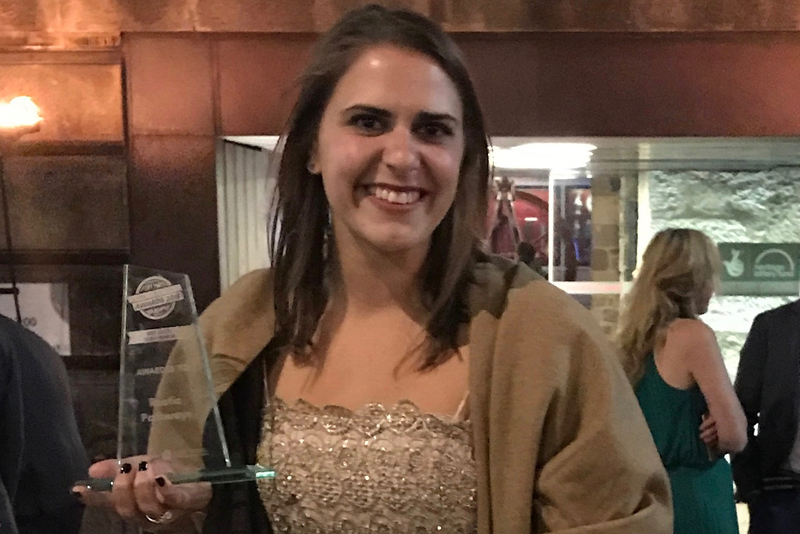 Rustic Social Media and Influencer Marketing Manager Liz Cortese accepts the 2018 Best Youth Tour Operator award in Edinburgh. The Best Youth Tour Operator is one of four awards given based on consumer voting. Thank you again for your support and for making Rustic the leader in high school community service and adventure travel. More than 10,000 students traveled with Rustic in 2018 on spring break and summer programs, teacher-led trips, and gap year semesters in 21 countries around the world. They participated in more than 100 different programs, developing new skills, and contributing to sustainable community service with our local partners. Join us next year to help increase that impact around the world! Click below to request a free copy of our spring break and summer programs catalog today.